The Federal Energy Regulatory Commission broke the law in two key ways that discounted and endangered African American and American Indian communities in Virginia and North Carolina in approving the proposed Atlantic Coast gas pipeline. That’s what environmental, civil rights, faith-based, and other groups contend in a brief filed in federal court. NRDC and nine other groups filed an amicus brief on April 12 challenging FERC’s approval of the Atlantic Coast pipeline on environmental justice grounds before the U.S. Court of Appeals for the D.C. Circuit. The groups want the court to declare FERC’s approval of the pipeline null and void or order FERC to conduct a new environmental justice review. The other signers are: Center for Earth Ethics; Kairos Center for Religions, Rights, and Social Justice; North Carolina Poor People’s Campaign; Repairers of the Breach; Satchidananda Ashram – Yogaville; Union Grove Missionary Baptist Church; Virginia Interfaith Power & Light; Virginia State Conference NAACP; and WE ACT for Environmental Justice. The brief details how FERC failed to serve the public interest in evaluating, and approving, construction of the proposed 600-mile, $7.5 billion Atlantic Coast project. Dominion Energy is seeking to build the pipeline to transport gas through West Virginia, Virginia and North Carolina. “If the Federal Energy Regulatory Commission conducted a thorough public interest analysis, as it should, a balanced and accurate environmental justice review would further demonstrate what is already known: that the Atlantic Coast Pipeline is not needed to meet our energy needs, is environmentally unjust, would cause permanent environmental damage, and should be rejected,” said William Barber III, Co-Chair, Ecological Devastation Committee, North Carolina Poor People’s Campaign. FERC’s most egregious error was relying on a deeply flawed methodology to identify environmental justice communities affected by the Atlantic Coast project and failing to address the adverse impacts of the project. 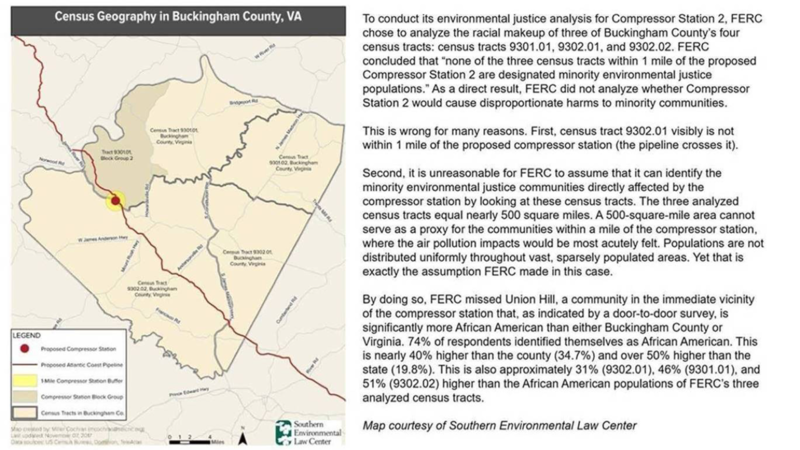 First, FERC relied on three large census tracts to analyze the potential impact of a planned gas compressor station for the pipeline in Virginia’s Buckingham County. Because the census tracts covered 500 square miles and included largely white rural areas, FERC found no environmental justice communities were near the compressor site. That’s even though the compressor site would be in Union Hill—a largely African American community founded by freed slaves. Through its flawed analysis, which included another error that ruled out identifying an environmental justice community, FERC essentially erased or buried Union Hill. The end result: FERC cooked its analysis and found no harm would come from the air pollution generated by the industrial compressor facility on a community of people who would be disproportionately impacted by air pollution. A map of this issue with further explanation is here. Second, FERC lumped all “minorities” together, which led it to overlook the fact that 25 percent of North Carolina’s American Indians, about 50,000 people, live along the Atlantic Coast route. The end outcome: FERC offered no analysis of the impacts of the pipeline on American Indians. Because FERC failed to identify these communities of color in Virginia and North Carolina, it didn’t analyze the health and environmental risks they face from the pipeline and its compressor stations, the groups charge. It’s well documented that pollution emitted from compressor stations exacerbates health issues like asthma and cancer risks that disproportionally affect communities of color. Incredibly, even when FERC did identify a minority community—like the one near another planned compressor site in North Carolina—it dismissed the disproportionate health risks, saying that pollution levels would be within legal limits. But that doesn’t constitute an analysis of the impact on the community—it’s a dodge. Further, the Environmental Protection Agency has found the pollutants present health risks at any level, the groups note in their brief. The groups argue that in its environmental justice review, FERC violated the Administrative Procedure Act (APA) and the National Environmental Policy Act (NEPA). They hope the court agrees and decides to take action against FERC. The legal brief is here. A blog on the issue by NRDC’s Montina Cole is here. A map showing one way FERC evaluated whether an environmental justice community exists near the proposed pipeline’s compressor facility in Virginia is here.